The USDA issued its 2019 Prospective Plantings Report recently and flax acres are expected to have a significant rebound from last year. Growers intend to plant 345,000 acres of flaxseed nationwide, up 137,000 acres or 66 percent from 2018. Acreage in North Dakota, the largest flax-producing state, is expected to be up 76 percent, or 125,000 acres, from 2018 to 290,000 acres. The USDA issued its Annual Crop Production Report on February 8th. The report indicated U.S. production of flaxseed in 2018 totaled 4.47 million bushels, up 16 percent from the previous year. Harvested area totaled 198,000 acres in 2018, down 27 percent from the previous year. Harvested acreage in North Dakota, the largest flaxseed-producing State, was estimated at 158,000 acres, down 31 percent from 2017. The average United States yield for 2018, at 22.6 bushels per acre, was up 8.5 bushels from 2017. North Dakota’s estimated yield at 24 bushels per acre was a record high in 2018. January 21, 2019, Bismarck, ND —Flax looks like a good option for growers in 2019. Recent crop budgets from North Dakota State University show flax profits in many parts of the state. Flax showed positive returns of $4 and $18 per acre in the northwestern and southwestern regions. Many growers have consistently had flax yields over 30 bushels per acre, therefore based on this yield, net returns are projected at $79 per acre. These expected returns are very similar to predictions made by both Saskatchewan and Manitoba agencies. Healthy Oilseeds, a processor and exporter of grains and oilseeds from Carrington, ND, recently encountered trade barriers while exporting to Peru and Algeria. With the help of the US Commercial Service (CS), Healthy Oilseeds was able to remove these barriers and successfully complete sales in both countries. A first-time exporter to Algeria, Healthy Oilseeds received a notice in French from a third party about new regulations, where Algerian importers were now required to wire 120% of payment for imported goods to banks thirty days before a shipment leaves port for Algeria. These regulations took effect in October 2017, at the time that Healthy Oilseeds had a shipment en route to Algeria. The regulation served as a way for the Algerian government to better account for incoming shipments, as well as cover possible weakening in the Algerian Dinar during the thirty-day posting and time at sea. Gussiaas contacted CS North Dakota for urgent assistance, and over a weekend, CS North Dakota Director Heather Ranck contacted the Senior Commercial Officer at the U.S. Commercial Service office in Algiers, and he quickly replied that the regulation only applies to finished goods, so Healthy Oilseeds’ products were exempt from the regulation. CS North Dakota staff also quickly facilitated a required document translation into French, as one of the students working at CS North Dakota was a fluent French speaker. With this assistance, Healthy Oilseeds successfully completed the transaction in Algeria. Healthy Oilseeds also conquered a trade barrier in Peru. After participating in a trade mission, five Peruvian companies were interested in buying from Healthy Oilseeds. However, after the order had already been processed, they were informed that Peru allowed shipment from Canada and Bolivia, but not the US. Soon after this problem emerged, Steve Presing from the Enforcement and Compliance (E&C) division of the US Department of Commerce’s International Trade Administration came to Fargo for the ND Trade Office annual conference in April 2018, when he learned about this trade barrier directly from Gussiaas at a ND District Export Council meeting. E&C works to remove or reduce foreign trade barriers for US companies. When Presing returned to Washington, DC, he contacted APHIS (USDA’s Animal and Plant Health Inspection Service) and APHIS worked with the Peruvian plant protection agency to verify that the product passed all phytosanitary tests, thus helping Healthy Oilseeds comply with requirements for the import of the product. Healthy Oilseed was then able to successfully deliver the product to their new customers. “We did not know where to turn to resolve these issues, and the U.S. Commercial Service not only made it easy to find the right people who could help us, but their intervention led to quick solutions. If Heather doesn’t have an answer she knows someone that can help,” said Roger Gussiaas, owner of Healthy Oilseeds. “The global network and the helpful attitudes of the staff within the U.S. Commercial Service is of tremendous value to businesses here in the United States.” For more information on Healthy Oilseeds, click here. For assistance with potential trade barriers, contact Heather Ranck at heather.ranck@trade.gov. Some market firms have advised selling a quarter to a third of your 2018 production at prices of $10 per bushel as cash prices have ticked higher this summer. Traders do note, though, that there is no reason for flax prices to go down. Forecasts for U.S. production are down significantly from past years as flax acres have taken a back seat to other crops. Total planted acreage in 2018 was forecast at 168,000 acres in USDA’s June 30 Acreage Report, just over half of last year’s acres. However, in reviewing the September Farm Service Agency Crop Acreage Data, https://www.fsa.usda.gov/news-room/efoia/electronic-reading-room/frequently-requested-information/crop-acreage-data/index, North Dakota flax acres came in at just over 150,000, which is 40,000 acres higher than the June 30 USDA estimate. This recent FSA report indicates total U.S. flax acreage at 208,000. Given normal acreage abandonment, if yields average 22 bushels per acre, this will result in total production of 4.5 million bushels, 18 percent higher than last year’s drought impacted production, but half the production from 2016. Actual yields will not be known until USDA publishes its Annual Crop Production Report in January. Those actual numbers will be posted on this website when published. In Canada, Stats Canada estimates planted acres of 856,800. This will result in 19.4 million bushels, down 11 percent from last year’s 21.8 million bushels. This is below trade expectations following a revision lower in planted acres. This estimate may increase as much of Canadian flax was grown in areas that received good moisture this season. Decreased North American production has been price supportive, resulting in prices in this region higher than the rest of the world. Marketers do note that this does not indicate a topping in the flax market, rather an opportunity to sell a portion of this year’s production at a level that has met resistance in recent years. Two statistical reporting agencies in Canada differ in their estimate of flax carryout levels for this year’s crop. In its August 17th Outlook for Principal Field Crops Report, Agriculture and Agri-Food Canada (AAFC) reported ending stocks to be 85,000 mt. More recently, Stats Canada reported ending stocks will likely be just 67,000 mt, 21% lower than AAFC’s estimate! This ending stock level is considered very tight. 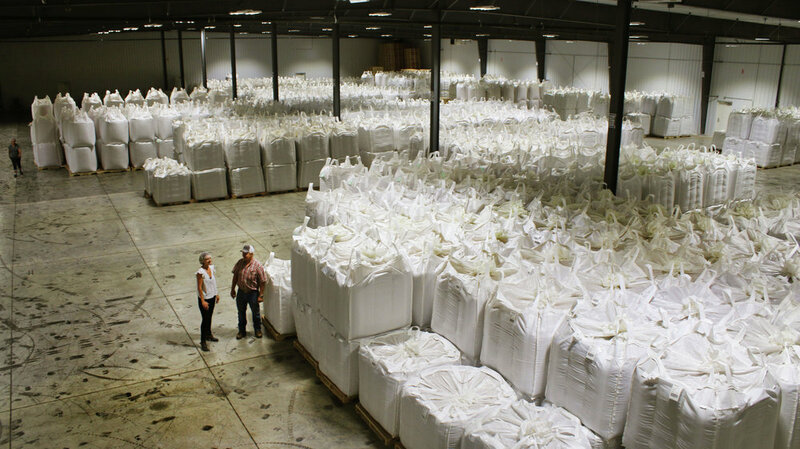 RICHARDTON, N.D. — Stone Mill LLC seems to be an island of prosperity amid the stormy seas of agricultural commodity prices and trade woes. the following research projects for the 2018 growing year. In 2017, research allocations were increased and those projects with an agronomic focus were weighted higher in selection. Below you will find a brief description and the author of each project. To best utilize the flax checkoff dollars in North Dakota, the board believes that these projects will have the biggest impact for growers in the state and greatest financial benefit. AmeriFlax also tries to balance the geographic locations of the projects within the state. Pollinator plantings are being encouraged as part of some government conservation programs as well as being promoted as good environmental stewardship for some land-uses. This study is looking to identify the role of insect pollinators on flax yield to see if there could be a synergy between crop production and pollinator habitat. Flax yield and quality will be the primary evaluation for this study. The main treatment to compare yield and oil content between plots in which bee pollinators are able to visit, and plots in which pollinators are excluded. Pollinators will also be identified to further understand which populations of bees are most important to flax. If insects are contributing a sizable portion to flax productivity, it stands to reason that enhancing surrounding habitat for pollinator success would lead to more economic stability for flax producers. This study will further focus on any yield and quality differences to be translated directly into economic loss or gain, based on the imposed treatments. Continuing ongoing research that was initiated in 2017, the primary objective of this project is to determine how the different approaches farmers may utilize for harvesting a flax crop and how it might affect the ultimate seed yield and associated oil content a quality of that crop. Currently, as producers anticipate the harvest operation, they will follow a practice of either windrowing (swathing) the crop or will apply an herbicide desiccant at physiological maturity. Physiological maturity in any crop is the growth stage when that crop has achieved maximum dry matter deposition in the seed. Both windrowing and the application of a desiccant at physiological maturity, should permit seed yield and oil content/quality to be optimized. Using a multispectral camera mounted on an unmanned aerial system can help to assess boll color and maturity. In practice, flax producers will initiate the harvest operation based on their determination that the crop has reached physiological maturity. Crop condition factors, along with the challenges in assessing the brown boll state, could result in windrowing or desiccation prior to actual physiological maturity. In theory, if flax is terminated by either windrowing or desiccation before physiological maturity, the seed yield would be reduced and oil content or quality would be impacted. This project will provide information that will clarify whether flax harvest strategies have an influence on seed yield, oil content and oil quality. Further information will be gathered on the effectiveness of different herbicide desiccants that producers may select as a harvesting aid. Aerial imagery will be used to determine any opportunities for remote sensing management aid. Continuing on the research completed by Dr. James Hammond, this project continues to determine and look at new flax genetic lines. New crosses are made each year and progeny is constantly moved through the “breeding pipeline.” This project will include traditional breeding activities. The identification of improved flax breeding lines that are candidates for variety release and best suited for North Dakota/northern great plains. Both brown and gold-seeded lines are being developed which look at being most acceptable to processors and end-user and most viable to producers. Based on agronomic performance, current materials will be identified using replicated yield trials from multiple locations across North Dakota. Quality, yield and disease resistance will be of greatest priority in determination. For support of ongoing flax variety trials that are composed of 15 varieties and experimental lines grown in ND at six NDSU Research Extension Centers across the state. Also included will be an organic trial as well as an irrigated trial. Data generated from these trials will provide information and varietal comparisons of agronomic, seed quality and seed yields to support variety development and recommendations. Based on the world demand for protein sources due to population growth, flaxseed protein will be evaluated for protein isolation in food application. The functional properties of thermal stability, solubility, emulsification and foaming will be evaluated for applications in food sources. Only a few studies have been done historically. There is a general lack of knowledge on the US flaxseed crops (flaxseed protein) through the development of high flaxseed protein food as in physicochemical properties of flaxseed protein isolates and under testing conditions. Therefore, the primary objective of this research is to promote the US flaxseed crops with flaxseed protein through the development of high flaxseed protein food. In that context, the aim of this project is to gain fundamental understanding of how the protein extraction processing and protein isolation techniques impact the physicochemical and functional properties as compared those commonly already used in the market. This proposed research will evaluate the effect of flaxseed on conception rate in commercial range ewes. The diets will be balanced for fatty acids. The hypothesis is that an increase in conception rate and lambing percentages in ewes fed flaxseed compared to that of the control. Additionally, evaluation of the effect of flaxseed on the morphology and concentration of the sperm in rams. It is expected to increase the concentration and overall improvement of sperm morphology as compared to the control. Successful pregnancies are the foundation of profitability for the sheep industry and its producers. This research will attempt to increase the fertility of rams and to increase ovulation rate and fetal vitality of ewes. If successful, this data will suggest flaxseed as the feedstuff of choice to use in preparation of rams for the breeding season and in flushing ewes during the pre-breeding season. Producers expect to see increases in first time mating conception and increase in lamb crop if the trial proves successful. North Dakota has over 52,000 head of breeding sheep that may be impacted by this project. For the 52,000 ewes, it requires over 2500 head of rams to initiate pregnancy. A feeling protocol utilizing flax, either as a supplemental grain or incorporated into a free choice block, would improve pregnancy rate in ewes and improved reproductive efficiency. This in turn, increases market demand for locally produced flax seed.